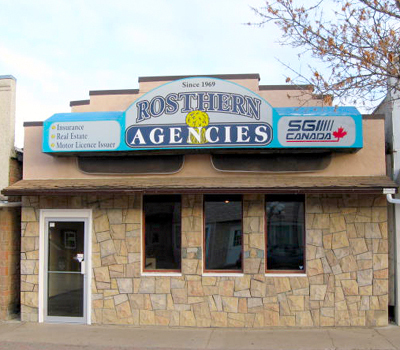 Rosthern Agencies is an independent, locally owned, full service insurance, motor license issuer and real estate brokerage. Ron Derksen – Co-owner since 1990, Insurance Broker, Motor License Issuer and Notary Public. Ron Regehr – Co-owner since 1990, Insurance and Real Estate Broker, Motor License Issuer and Notary Public. Ron specializes in the Rosthern real estate market. Leo Schulz – Co-owner since 2011, Insurance and Real Estate Agent, Motor License Issuer and Commissioner for Oaths. Brian Roth – Real Estate Agent since 2005. Brian specializes in Farm, including dairy and poultry real estate. Carl Lehmann- Real Estate Agent since 2010. Carl specializes in Farm and acreage real estate as well as the small town markets around Rosthern. NEW – See the SGI Online Services link. Select Online Vehicle Renewals are available NOW! Call or stop by our office to add your e-mail to your personal account. Our location at 1012 6th Street Rosthern.